What do you call something made with carrots, bananas, dates, zero unnatural sugar, and whole wheat flour? Hopefully, you wouldn’t call it dessert. And usually, neither would I. 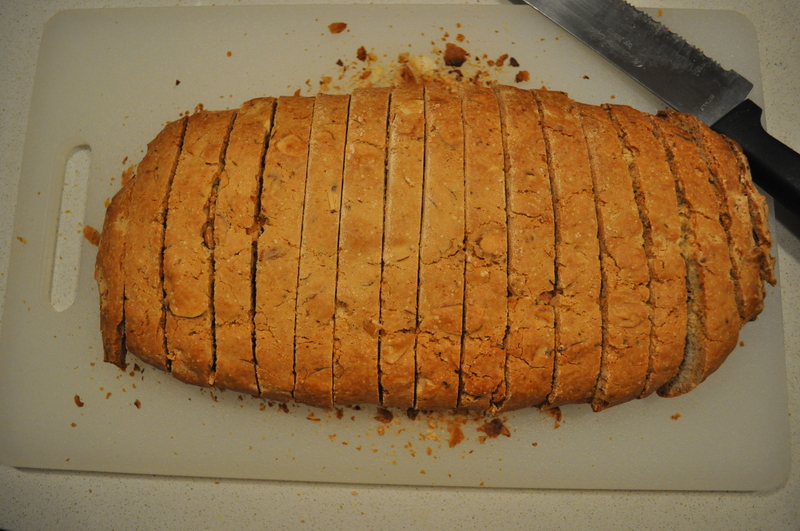 But there is something so intriguing about this recipe for…bread. 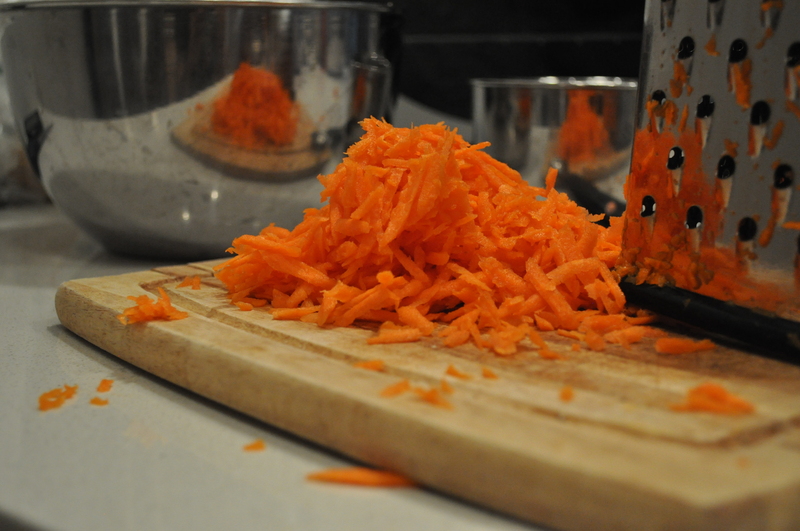 It’s a crazy extreme healthy approach to a carrot cake. 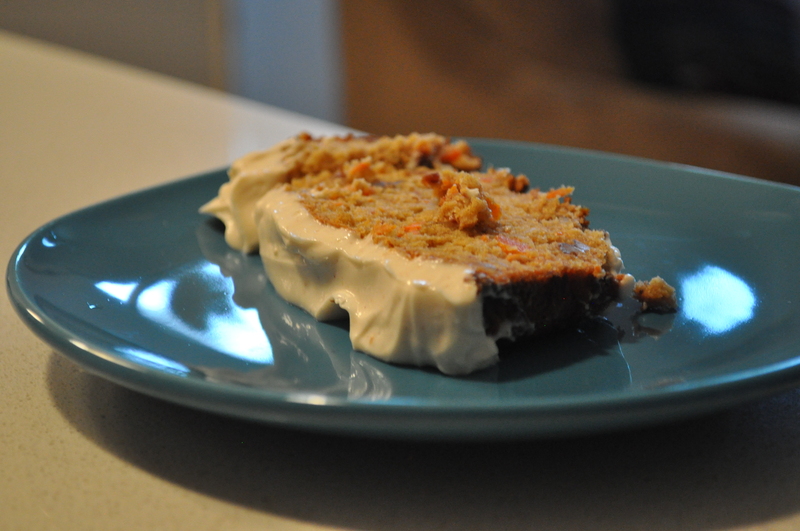 It has all of the necessary ingredients of a carrot cake: carrots, of course, cinnamon, cream cheese frosting, even! But with the added benefit of healthy whole wheat flour and zero unnatural sugars. It basically sounds impossible for it to be tasty. So of course, I wanted to be proven wrong. Results? It’s not quite your grandmother’s carrot cake. Think of it more like a banana bread with cream cheese frosting slathered on top. We should even agree to call this breakfast and not dessert. But it totally works. You don’t miss the sugar too much. And the bites with the frosting are especially divine (don’t judge)! Regardless, it’s a tasty and healthy lead-in to a summer full of ice cream, pies and cobblers! I used whole wheat pastry flour, as the recipe indicates, but I would say that perhaps you shouldn’t be as virtuous when you give this a go. I think that the whole wheat flour is what gives this bread the most “healthy” taste. Try it half and half with all purpose flour, or even the full amount. And while we’re on this subject of virtue, I would even say that adding about 2-4 tablespoons of brown sugar to the batter would be just fine. But we would be bordering on calling it dessert with that. I would suggest, however, splitting the 1 stick of butter into 4 tablespoons, and replacing the other 1/4 cup with applesauce for maximum healthiness without the healthy taste. Preheat oven to 350. Grease a loaf pan and line it with parchment paper. Set aside. Pour the melted butter on top of the dates and set aside for dates to soften. Sift together the flour, baking powder, cinnamon, and salt. Stir in the walnuts and set aside. In a separate bowl combine the bananas and carrots. Whisk in the yogurt and the eggs (and the sugar, if using – see headnote). Puree the butter/date mixture, and add it to the banana/carrot mixture. Mix well. Add flour mixture and stir until everything comes together. Pour into prepared pan and bake for 45-55 minutes, until tester comes out clean. While baking, vigorously stir together the cream cheese, agave or maple, and the powdered sugar. After the bread has come out of the oven, let it cool slightly and then slather the cream cheese frosting on top, while still a bit warm. Biscotti and I have a love/hate relationship. I love it. It hates me. There is something so delightful about biscotti – a cookie that is meant to be dipped. How user-friendly! No sogginess involved, no fishing cookie-bits out of your coffee cup. Just a crunchy cookie that is waiting for a quick swim in your drink. Yum. But it just never seems to want to bake correctly whenever I have tried to make it in the past. I’ve had crumbly messes of biscotti on more than one occasion. I’ve had biscotti logs bake into each other, leaving me with a sheet pan of half-baked biscotti dough. I’ve tried using the non traditional recipes that included butter. No luck. 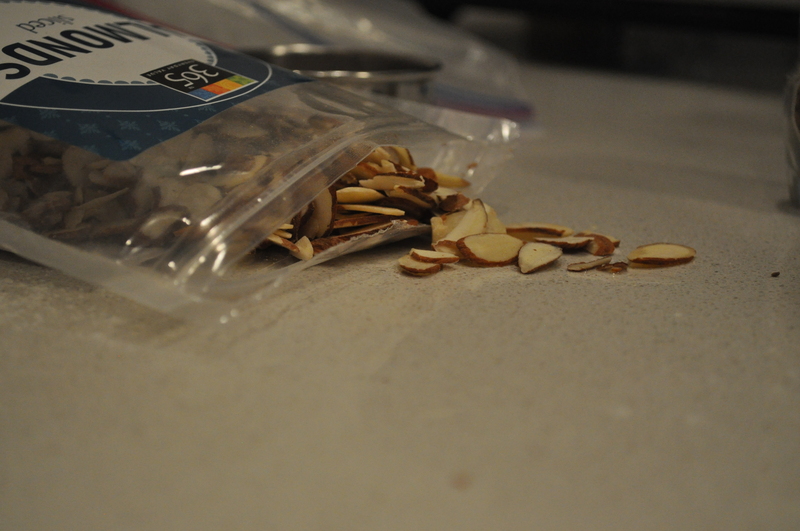 I tried it without adding in any kinds of nuts, seeds or chips. Not tasty. I’ve even tried rolling the dough into little balls so I could get biscotti cookies. A huge disappointment. 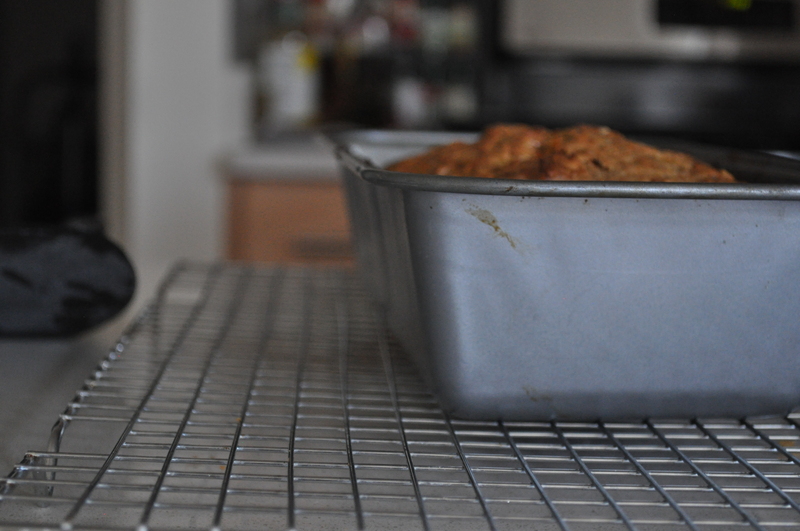 In the end, I believe that biscotti truly hates me and willfully decides against baking in my kitchen. But like any sane person, I decided that I would keep trying, chipping away at biscotti’s will to hate me until it completely backed down and couldn’t help but turn out beautifully in my kitchen. It seemed that all it needed was time. This particular biscotti recipe is not for the faint of heart (or those with the lack of time). It takes about 6 hours to make from beginning to end. And if you don’t plan ahead and still are completely determined to make amazing biscotti, you may have to set your alarm for 2:15 am to get up to take the biscotti out of the oven. (not that I’m speaking from experience…). Ridiculous, you might think. But totally worth it. Crisp and flavorful, chock full of nuts and spices – exactly what biscotti is supposed to be. I think that biscotti and I may just call a truce. 2. Beat eggs, sugar and vanilla on medium-high speed until pale in color and slightly thickened. If using a hand mixer, this process will take about 10 minutes; 5-6 minutes on a stand mixer. Add anise seeds and beat to ensure that they have properly mixed in. 3. Stir together all of the dry ingredients and almonds. Pour the egg mixture into the dry ingredients and stir until thoroughly combined. The dough will be sticky. 4. 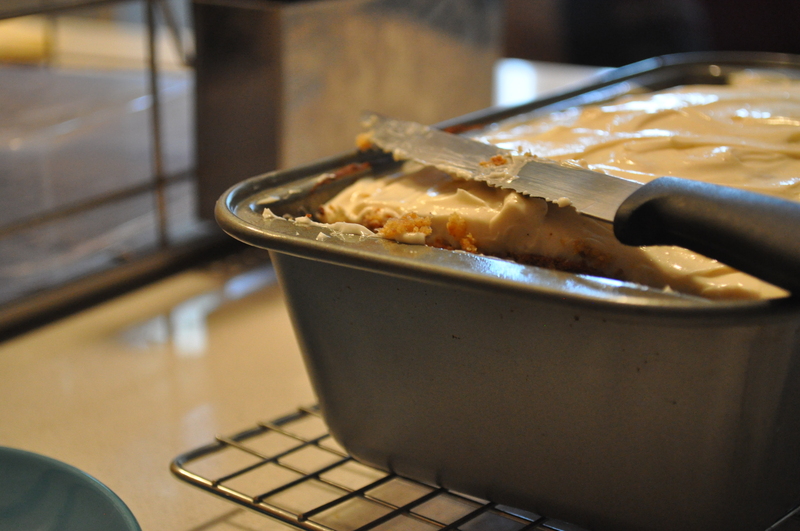 Scoop dough onto the prepared baking sheet and form into a log, about 5 inches wide and 12 inches long. Damp hands will help with this process as the dough is very sticky. 5. Bake for about 50-60 minutes, until the log is firm and has turned a golden brown color. Turn the oven temperature down to 200 degrees. Let the log rest and cool for about 30 minutes. 6. Using a serrated knife, slice the log into 1/2 inch wide biscottis. 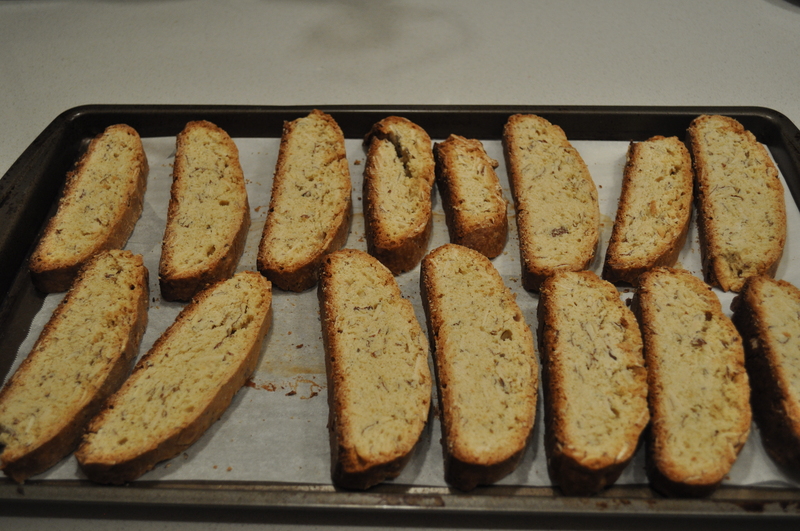 Place the biscotti, cut side down onto the same parchment-lined baking sheet. 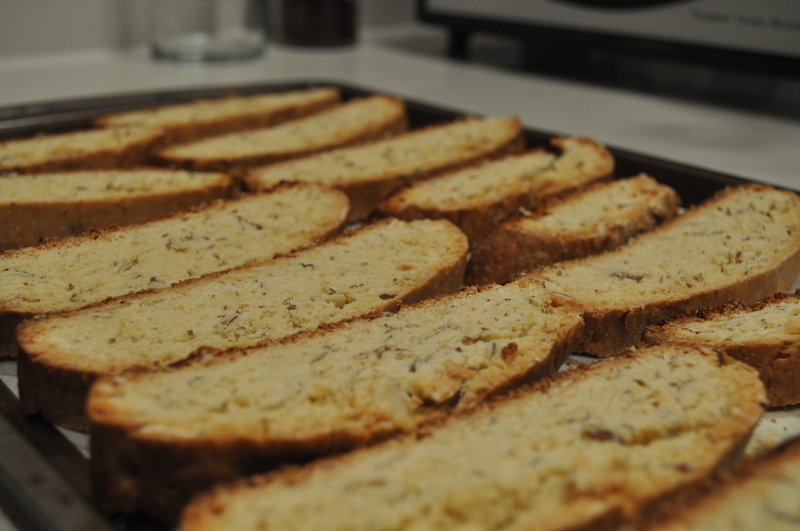 Bake for an additional 4 hours, until the biscotti is completely baked through and crisp.